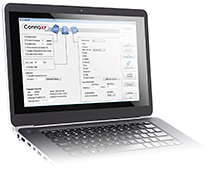 Download the latest version of ConFigXP (2.5) here. Version 2.5 16-Dec-16. Added Calibration Message support. ConFigXP users with XP2i firmware R040324 and newer can set a calibration due date and calibration due warning period. Once enabled, these messages will display at startup of an XP2i and optionally during operation. Version 2.4d 31-Oct-08. Added support for latest generation XP2i gauges. Enabled MPa unit and saving logging interval and type to a file. Version 2.4b 14-Apr-08. Fixed a bug with an incorrect tank level unit calculation when using desnsity units of lb/yd3. Version 2.4a 29-Feb-08. Fixed a bug when USB was removed while still connected to the gauge. Version 2.4 25-Jan-08. Added an offset to user units. Added a linear fit wizard for user units and a tank level wizard to assist in calculating user factors and user offsets. Vacuum mode was added for -DP gauges. Version 2.2 21-Aug-07. Added PSV (pressure safety valve) mode. Fixed a problem communicating with COM ports greater than 9. Version 2.1a 23-Mar-07. Added Czech, French, German, Italian, and Japanese languages. Version 2.1 05-Nov-06. Added differential gauge capability. Fixed a password bug in the as received/as left report.. Version 2.0a 18-Sep-06. Added Chinese and Polish translated versions. Version 2.0 03-Apr-06. Added ability to load and save configurations, reset to factory configurations, password protection, as received/as left report, and a userspan wizard. Version 1.6b 01-Dec-05. Added Spanish language. Version 1.6a 23-Jun-05. Added support for WT Series gauges. Version 1.5a 19-May-05. Added support for absolute pressure XP2i gauges. Added rate mode for dual display (-DD) gauges. Version 1.4a 01-Dec-04. Added communication with a DataLoggerXP enabled gauge. The gauge cannot be in DataLoggerXP mode in order to connect to ConfigXP. Version 1.2a 10-Sep-04. Fixed a battery detection bug when connecting to older XP2i gauges.